Some participants have been kind enough to send me in reviews and comments on the various walks that Hills of Hame offers. Thanks to everyone who has given me feedback, either for general sharing or via my Mountain Training Association DLOG referees page. If you are a MTA member and would like to be able to see all my DLOG referees reports, please get in touch and I can arrange access. Thanks for today. I enjoyed it and I am sure that the students did too. Really informative – on geology, ecology, heritage and palaeontology. I am sure that the students appreciate the integration of disciplines (especially in the context of guiding and interpretation) that you provided, the enthusiasm that you pervaded, and the discussion of the issues. Al replies: Thanks for coming out to explore the links between geodiversity and biodiversity with your students. Your photos of the day on your Twitter timeline (@jgilchrist13) were excellent. Thanks for posting those. Staff – An exciting new experience.The leader had lots of knowledge of the area and was very patient with the children, giving them time to explore and was able to answer all the questions. Kids – Orienteering is fun, a really nice place, enjoyed the walk, lots of fresh air and exercise, got to climb trees and learned lots about nature. Review on John’s site, with plenty of pictures from the day. I spent a day with Al in November 2016 in the Moffat Dale where the weather was pretty bad, wet and windy all day, however Al had planned the day well and we looked at 2 different areas in the relatively sheltered glens avoiding the high tops. The day was spent mainly looking at the geology of the area, Al’s ability to convey information is excellent very much laid back & putting you at ease but with an unquestionable level of knowledge in this field. 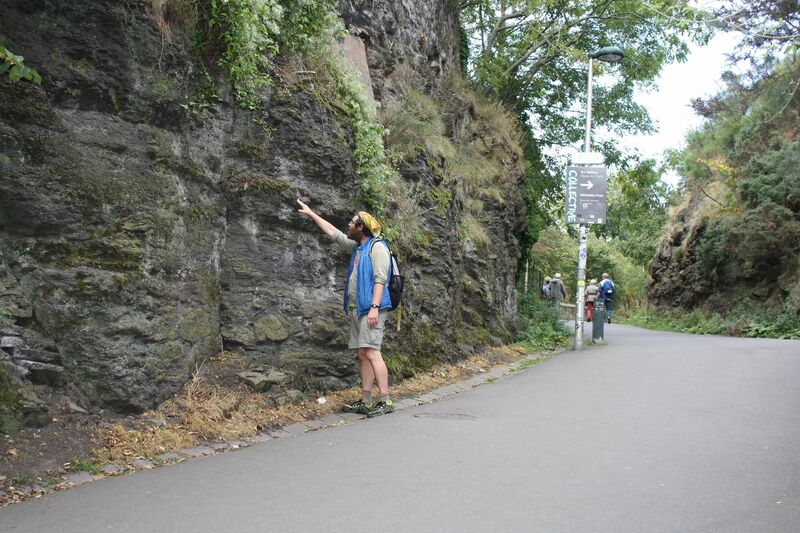 I am currently aiming for SML assessment and although I have done the usual reading Al was able to de mystify plenty and put geological features into lay man’s terms by practically pointing out examples on the ground. The day did all that was expected & more in a interesting, entertaining and engaging manner despite the poor weather. I had a thoroughly good day in good company with wide and diverse conversations & I learned plenty. Another Mountain Training Association hit yesterday, with a walk in the Pentlands in the company of colleagues in the [Mountain Training] Association and Al McGowan, a geologist & palaeontologist, based in the capital [Edinburgh]. Dr. McGowan provided the attendees with an insight in to the geology and physical geography of the Pentlands, his involvement in footpath construction on the range and also his participation in the “Carnethy 5 Hill Race”. This was an extremely informative day and any Group wishing to expand on an outing in to the Pentlands might wish to consider using Al’s services.